In addition to the traditional dimensions of risk relating to likelihood and impact, leading companies have added an additional dimension to their risk assessment factors, velocity. With information available instantly around the globe, the speed, or velocity, with which a risk event can impact your business must be considered. Risk velocity is compounded with the volatility of an uncertain economic environment and the demands of rating agencies, boards, banking regulators and other agencies. 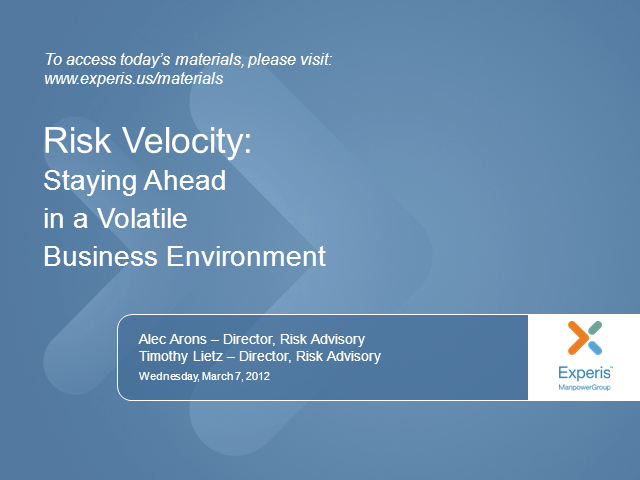 Risk velocity must be evaluated as a core component of a leading risk assessment process.